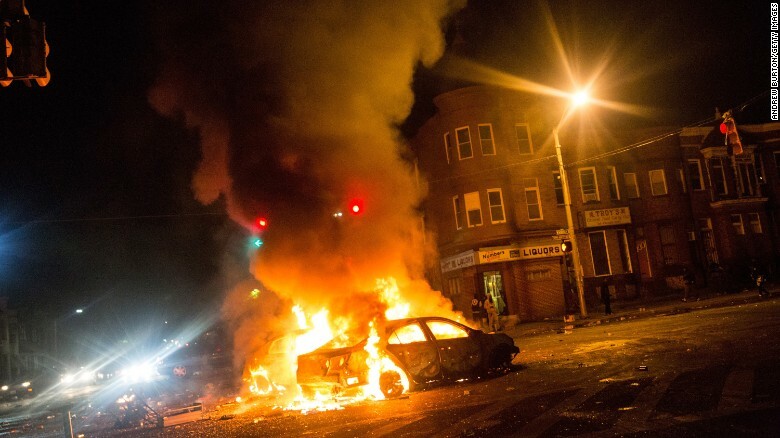 Baltimore's riotous streets have given way to calm. 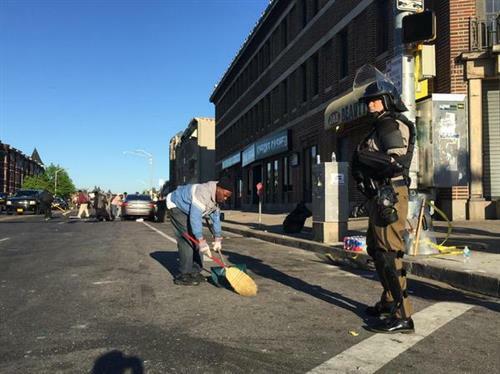 Police backed by 2,000 National Guardsmen restored order in the city. There were some minor skirmishes, but all in all an overnight curfew held. Police arrested two people for looting and one for disorderly conduct, but most of the 10 arrests made after the 10 p.m. curfew were for curfew violation. 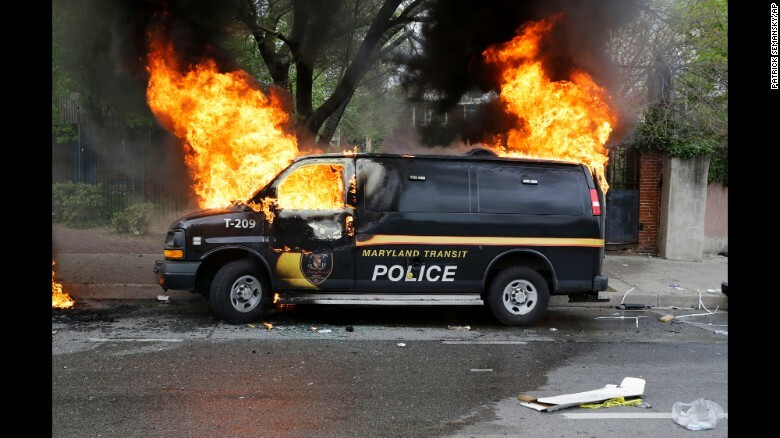 The city exploded on Monday after the funeral of Freddie Gray, a 25-year-old black man who mysteriously died on April 19, a week after Baltimore Police arrested him. Among the business looted in Baltimore are a CVS Pharmacy, a check-cashing store, multiple liquor stores and shoe stores. "We were fully prepared. We had all the assets ready." 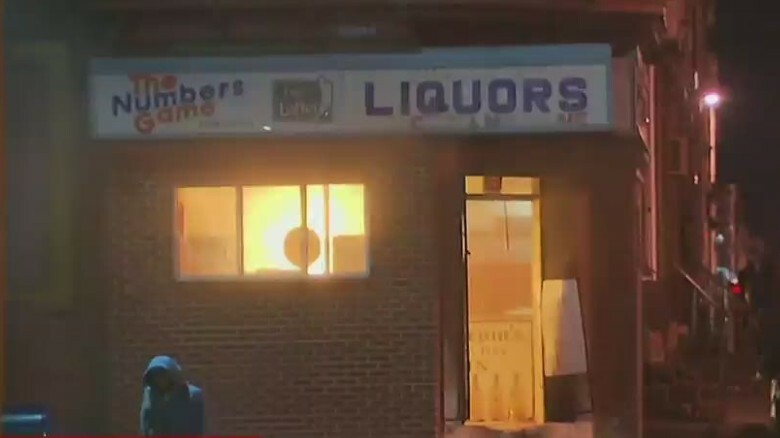 CNN reporters witnessed looters breaking in through the roof of a Baltimore liquor store and tossing bottles and cans of alcohol onto the street below. Just moments ago, this car came flying up this block. I'm saying flying up this block, right into the face of the officers. Oddly, that emergency vehicle over there didn't move. It looked like he was going to ram right into the cops. Nobody fired at him. Nothing happened. I couldn't believe that they didn't move. He then did a U-turn and ripped down the block. And then a series of cars started coming down. I've never seen anything like that in one of these situations -- from CNN's Chris Cuomo. 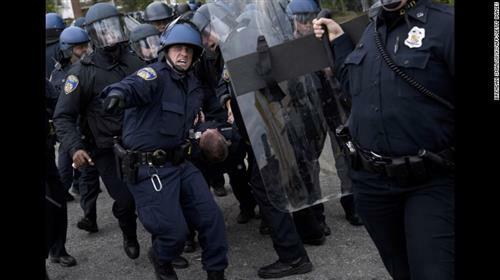 Six Baltimore police officers were seriously injured in Monday's violence, Police Commissioner Anthony Batts said. He said many of the instigators appeared to be high school students. 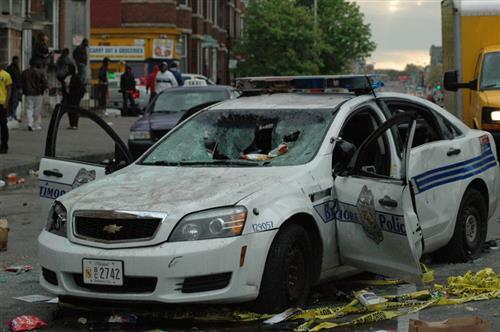 "I think they thought it was cute to throw cinder blocks at police," Batts said. 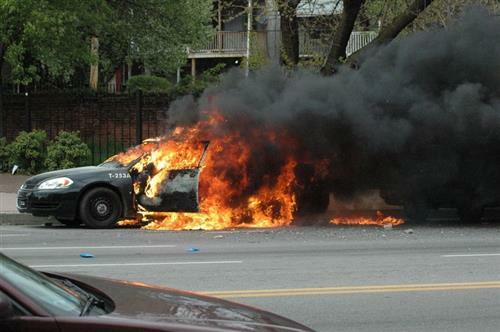 Meanwhile, several street fires and car fires continued burning late into the night as sirens blared nonstop in the city. 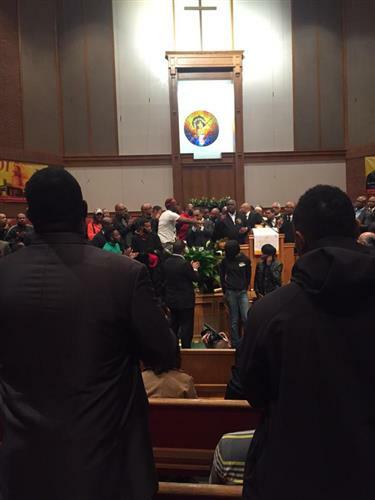 Members of the Bloods at Baltimore's New Shiloh Baptist said they were trying to push back looters from businesses. 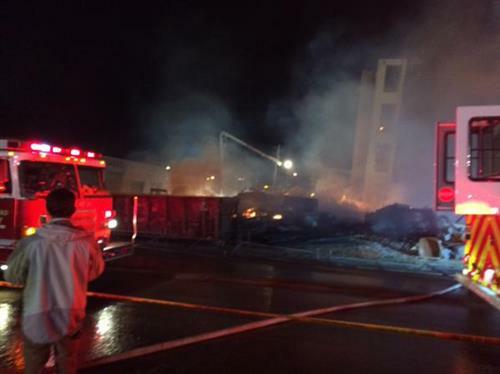 The latest fire is burning at Gilmor Homes, in a mixed-use neighborhood in West Baltimore. 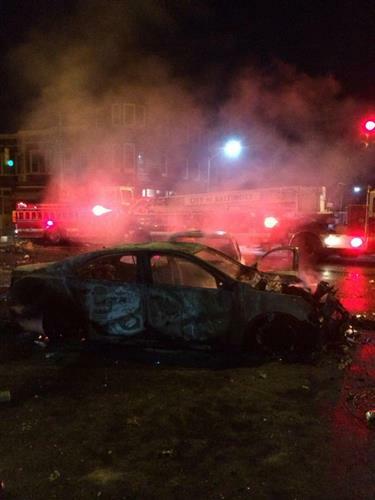 Other parts of West Baltimore now look like a "war zone," CNN's Brian Todd said from the scene. 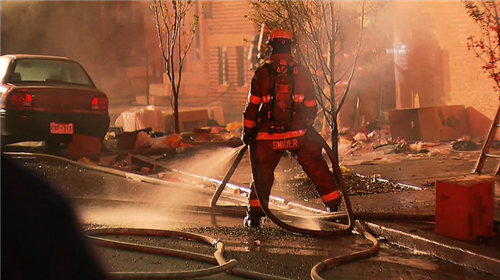 Small fires and looting spilled into Tuesday morning across the city. To ensure safety of students & in compliance with daytime curfew for youth, schools closed April 28. District office open, w/ liberal leave. We will work with our law enforcement partners throughout the night to deploy resources in the city. 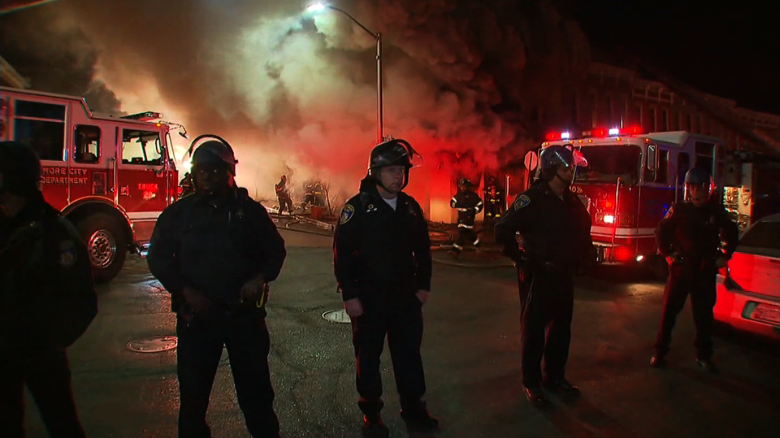 Vandals cut Baltimore Fire Department hoses, making it difficult to get water on the flames. We are deploying officers with the fire department to ensure fire fighting operations are not disrupted by people w/ no regard for life. 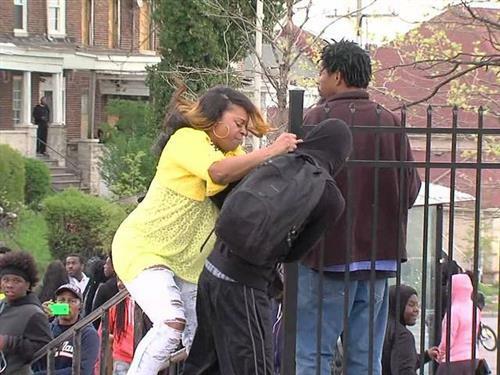 WMARThis Baltimore mom saw her son throwing rocks at police on television. It will take all of us working in partnership. We will do whatever it takes. Despite the evil we see tonight, this is our home. A general curfew will be in effect in Baltimore City from 10pm April 28th - 5am May 4th unless renewed or rescinded by order of the Mayor. "I don't think that's for Freddie," Freddie Gray's twin sister Fredericka Gray says of the rioting. "I think the violence is wrong." 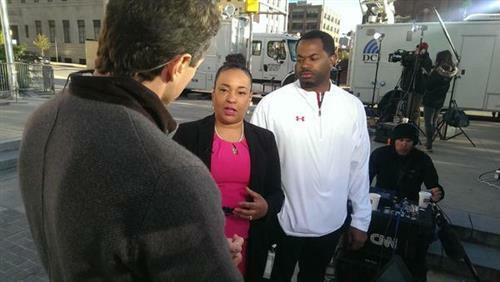 CNN's Joe Johns speaks to veteran Robert Valentine who told rioters they need to go home. The city is under a state of emergency. Baltimore firefighters battled fires after rioters got out of control after the funeral of Freddie Gray. 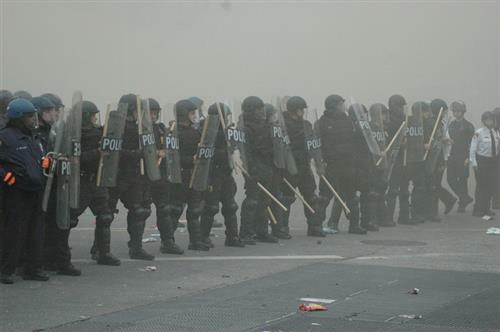 CNN Law Enforcement analyst Tom Fuentes weighs in on the Baltimore Mayor's statement to allow "space to destroy" for rioters in Baltimore. Neill Franklin, a former Maryland state police officer who has worked with Baltimore police, told CNN's Chris Cuomo that law enforcement officers "were prepared physically" for Monday's unrest but "they were overwhelmed by the number of students." He said not enough officers were deployed in the right places, something he attributes in part to a "fluid situation." Though Baltimore's Metro Subway is running this morning, three stations -- Mondawmin, Upton, and Penn-North stations -- are closed temporarily. The Rev. 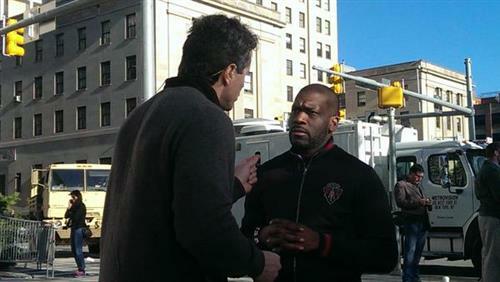 Jamal Bryant, a Baltimore minister who has been pressing for nonviolent protests over Freddie Gray's death, told CNN's Chris Cuomo minutes ago that it was a mistake for Baltimore city schools to cancel classes today. "Today, schools are closed, which … I think is a bad mistake. Because these are young people out. What are you going to do productive?” said Bryant, of Empowerment Temple Church. He said he's inviting students to his church today for two events. 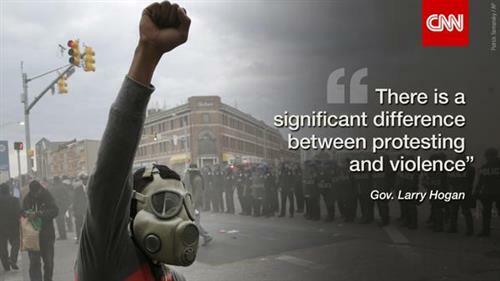 First is a one-day training session on how and why to engage in civil disobedience nonviolently. After that, he said he will take students into riot-damaged areas "to go clean up what is messed up." Though he pushes for nonviolence, people are rightly enraged over a "criminal justice system grossly slanted" against African-Americans, Bryant said.